Ladder Line baluns are used to match the impedance seen at the end of the ladder line to a coaxial cable, usually 50 ohms, but a ladder line balun can also be used to match to 75 ohm coax like RG-6/U used for cable and satellite installations. While RG-6 doesn’t have the same power rating as larger cable, it is very useful for beverage antennas or receiving antennas which don’t carry a lot of power. The impedance seen at the end of the ladder line will not be the same as the characteristic impedance of the ladder line (typically 300 or 450 ohms). 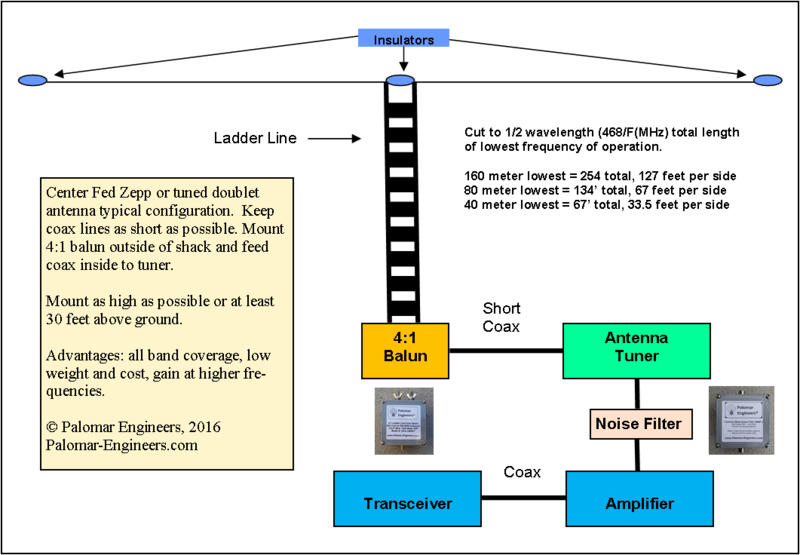 Good ladder line antenna designs try to have the impedance at the end of the ladder line attachment to the balun close to 200 ohms so that a 4:1 balun can be used to match to 50 ohm coax. Palomar Engineers has ladder line to coax 4:1 baluns in both kit form and also assembled in a variety of 1 watt to 10KW power levels to suit the needs of many customers. The ladder line baluns are designed for balanced output and are generally used at the end of a run of ladder line from the antenna. The baluns connect to the ladder line and then transition to coax cable to you antenna tuner or radio station.